ChemKnits: Thank You Kickstarter Backers! We did it! The Dyepot Weekly Kickstarter Campaign was a smashing success. Thanks to you the Dyepot Weekly video series has enough funding for at LEAST the first 35 episodes. I have used the funds raised for new equpitment (including a new dyepot), new dyes (food coloring, natural dyes, Rit liquid dyes, Jacquard acid dyes), and a lot of bare yarn from KnitPicks (Affiliate Link). I would like to thank all of the Kickstarter backers for supporting my dream. 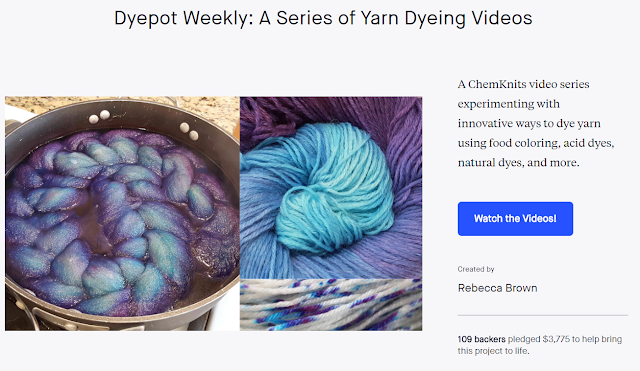 Not only did you fund the physical materials and supplies for the dyeing videos, but you have motivated me to create videos on a regular schedule. This support, knowing that so many strangers (who aren't really strangers to me anymore) want me to succeed gives me so much more confidence in my own abilitlies. I'm not sure where the future will take ChemKnits, but I am excited to find out. I do know that we will be dyeing a lot of beautiful colors together! Yarn Level Backers - From picking their own to just getting a little taste from a mini-skein, these backers supported my new endever. I hope that you love your yarn! Shout Outs - Thank you for believing in this project enough to support it for the digital rewards! Thank you, also, to everyone who wished to remain anonymous or who declined a shout out. Thank you also to those of you who selected the Cheer Squad or no reward, your vote of support means so much to me. Here is the official Kickstarter Thank You Video. I decided to add a dyeing project to the background of the shout outs. In this video, you will watch me space dye 200 g of yarn, 100 g of 100% superwash wool and 100 g of untreated 100% wool with some Easter Egg dye tablets. I sped up the dye spreading out 587% so you have something to watch while I read out the names. THANK YOU SO MUCH FOR YOUR SUPPORT! I really hope that I pronounced everyone's name correctly! At the publication of this Thank You blog post, 10 Dyepot Weekly episodes have been published. Is there a dyeing experiment you would love to see? Let me know in the comments and I can add it to the list! I look forward to the next year of dyeing adventures. This post contains some KnitPicks Affiliate Links. I have been using their yarns for years before becoming an affiliate in October 2017.